Hi, Aman! 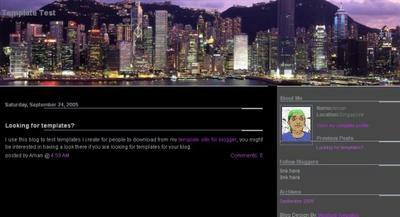 Nice template about HK, I love it! I got the code from your link, but am not sure how to use it. Could you enlight me on that a little? I am a green hand... Thanks a lot! I like the idea of this template a lot, but I would like to place a different picture on the header and I would like the background to be blue instead of black. Hilo Aman, thanks for the template but i'm not sure how to use it and how to change the picture? can you help me ahbdotcom@yahoo.com thanks! Aman--Love the template. I downloaded and tried to customize. Now Im having a problem with the text on my blog postings. It continues on infinately without moving to the next line down..and pushes my sidebar down below all posts. I fear I may have deleted some important code. Any tips or suggestions? Thanks.